myMantra is your way to carry your personal mantra with you every day, or gift someone special with their very own moment of motivation. 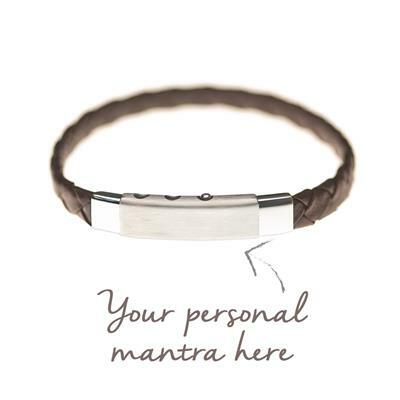 This Brown Plaited Leather and Stainless Steel Men's Bracelet is from the myMantra collection, enabling you to have a word or words of your choice engraved onto the Stainless Steel. It comes in an adjustable size, with three settings. We can engrave a word or short phrase onto the Stainless Steel. Choose an uplifting or inspirational word, which resonates with you. We have been asked for words like 'Freedom', 'Strength', 'Gratitude' or 'Wisdom'. The adjustable clasp and engraveable area are hard-wearing Stainless Steel. There is a brushed effect to the engraveable part, with a high polished finish on both sides to add a design detail. myMantra products are none-exchangeable or returnable due to the engraving. Max engravable characters: up to 14 characters.